The Moon is as old as the Earth, at about 4.5 billion years of age. For as long as there have been creatures on Earth able to observe it, the Moon has been there to be seen. In 450 BC the ancient Greek philosopher Anaxagoras realised that the Moon does not shine with its own light, instead bathing in the reflected glory of the radiant Sun. As early as 150 BC, the Greek philosopher ‘Seleucus of Seleucia’ considered the Moon to be the cause of tides on Earth. Today, we have landed on the Moon, leaving footprints, a feather from the famous “hammer-feather drop” experiment, even a cast golden olive branch lies amongst the countless other worldly possessions still orbiting Earth. More importantly we even brought lunar samples back home to study and explore. So, what more is there to know? For a thousand years people have described witnessing mysterious, fleeting phenomena across the face of the Moon, and once we had the tools to observe its surface, we saw evidence of a history of high-energy bombardment in the countless craters and shock waves that blanket it. It was only in 1997 that the first systematic attempts were made to identify impact flashes, and today ESA is one of a few organisations continuing to study these ‘transient lunar phenomena’. Q: First of all, what is a lunar ‘impact flash’, and why are you interested? There are many small, but fascinating and ancient pieces of material travelling at high speed through space, and I am interested in the smallest of them. My main research interest is cosmic dust, meteors, fireballs, and other minor bodies in the Solar System — particularly asteroids! 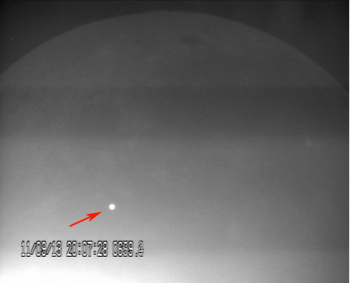 When a small asteroid or meteoroid hits the Moon, part of the energy is converted to light — and this is what we see as an ‘impact flash‘. Q: How are you involved in studying these fleeting flashes? I am involved in two projects whose main focus is lunar micrometeoroid impacts. 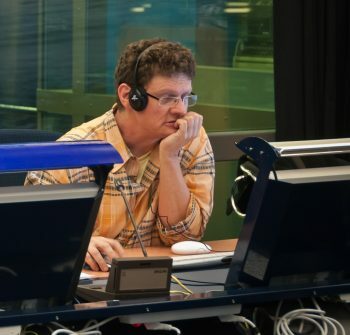 NEOLITA was launched by ESA at the National Observatory of Athens in February, 2015. It aims to determine the distribution and frequency of small near-earth objects (NEOs) by monitoring lunar impact flashes, using the 1.2m Kryoneri telescope located in the Northern Peloponnese, in Greece. 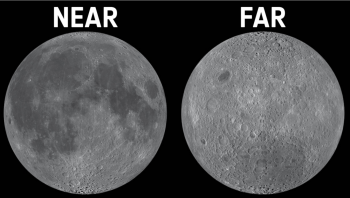 Like all other impact flash monitoring programmes, NEOLITA only observes impact flashes only on the dark side of the Moon — note that the dark side is entirely different to the far side! 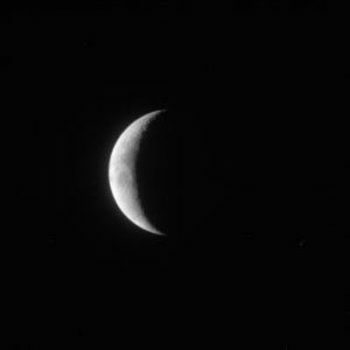 Unlike the ‘far side’ of the Moon which always faces away from Earth (and has a slightly different surface) the dark side refers to any part of the Moon that is not currently illuminated by the Sun, although — such as during a crescent Moon — it may still be facing Earth. Then there is LUMIO — the Lunar Meteoroid Impact Observer. ESA set a challenge last year (2017) — “Imagine sending a spacecraft the size of an airline cabin bag to the Moon – what would you have it do?” and LUMIO was one of the two successful answers! The plan is that LUMIO would circle over the far side of the Moon to detect bright impact flashes during the lunar night, mapping meteoroid bombardments as they occur! Q: How common are they, and what can they tell us? NELIOTA sees one flash on average every 2-3 hours of continuous observation time, so from that we can calculate that there are really are several per day. The light flash let’s us estimate the size and velocity of the object that hit it, and from this we can better understand how many of these objects hit the Moon, and how often. This is of particular interest to future astronauts that spend any time on the Moon! But this information also helps us understand the general environment that Earth and the Moon find themself in — with some scaling factors to account for the different gravity of the two bodies, we can use the lunar data as a proxy for impacts into Earth’s atmosphere. Q: How do impacts on the Moon differ from those on Earth? Earth’s atmosphere protects us from objects smaller than about 20 metres, so to get impact craters on our surface we need even bigger asteroids that can survive, intact, til they reach the ground. On the Moon everything reaches the ground, because it doesn’t have an atmosphere. This means that we get ‘hypervelocity’ impact craters even from very small objects that impact it. Q. Why are impacts on the dark side of the Moon important to study? Are they any different? Impacts are the same everywhere on the Moon, but it is much easier to see the flash of light they cause if they occur on the dark, rather than illuminated, side. This is for the same reason that we can only see faint stars only at night and not during day — the contrast is just not high enough. Q: Will the July 2018 eclipse provide any useful insights into lunar impacts? Normally we don’t observe during the Full Moon, because the complete side facing us is illuminated and is too bright. In principle it would be possible to search for impact flashes during the eclipse, as the Moon is in the shadow of the Earth — statistically speaking we may see one impact during the eclipse! As for special results — some people measure the redness or darkness of the eclipse to deduce something about Earth’s atmosphere. 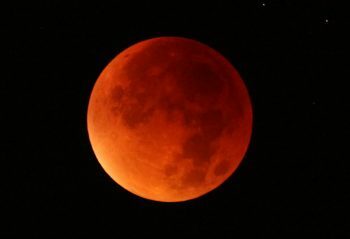 The reason why the eclipsed Moon is red is because while in principle it is in the shadow of the Earth, the red sunlight still manages to pass through Earth’s atmosphere and is indirectly scattered onto the Moon. 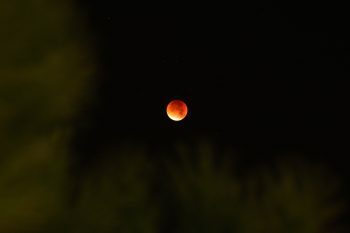 So, by looking at the intensity of the red Moon we could deduce something about our atmosphere. But as for our work on lunar flashes, eclipses don’t really provide new science results — but are of course something beautiful to enjoy.